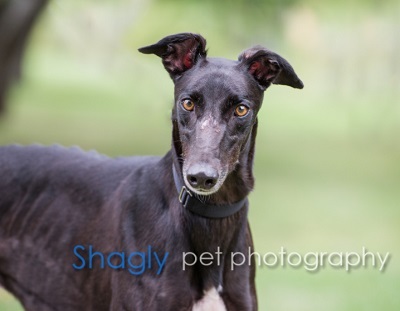 Pat, aka SH Pa Pow, is a 2 1/2 year old black male born October 10, 2014. His sire is SH Avatar and his dam is Mary Read. 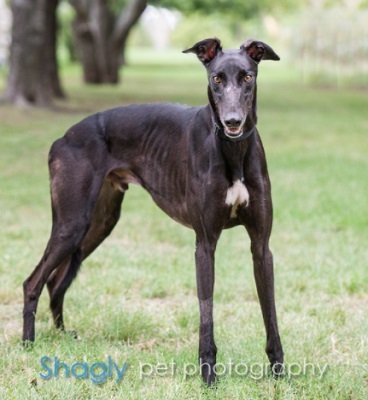 Pat has 25 races to his credit on greyhound-data.com, starting at Palm Beach Kennel Club in FL in July, 2016. He then moved on to Melbourne Greyhound Park and finally finished his career at Mobile Greyhound Park in AL on May 6, 2017. Pat is ready to settle down with a family of his very own. Pat is considered to be cat and small animal tolerant. Pat is a gentle and lovable 3 year old “Velcro dog” and a real people pleaser, he loves to follow you around the house while you do your chores and tasks. Pat is a master leaner, will put his head in your lap while you watch TV and loves getting good scratches while you relax. Pat does not get up on the furniture and is quite content in his own bed and space. If by chance you decide to get down on the floor, he is happy to share and cuddle with you! For the most part Pat does a good job learning house manners and easily. Pat is good with cats, only showing a brief bit of interest in their antics and he is easily corrected and diverted. If he's in his pen on a work day, he doesn't have any accidents or issues. Because he’s so tall, he does well in a pen and can do a crate though an open pen is his preference. Pat is good on a leash, is cat and child tolerant and is not food or space aggressive. He is a sweet, gentle easy going boy and deserves the best forever home! Pat is ready to stare into your eyes and melt your heart.